The Royal Mail have recently issued their Christmas Stamps for 2011. 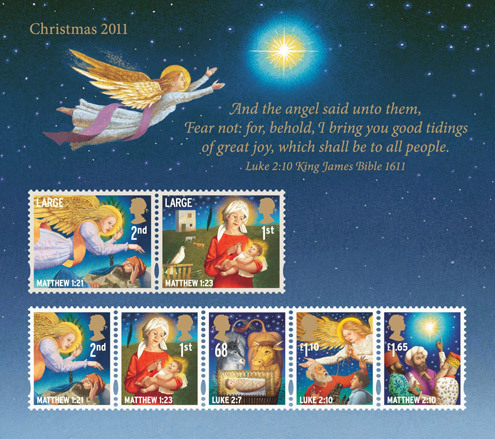 These beautiful stamps have the theme of the Nativity. They are inspired by verses from the Gospels of Matthew and Luke, and recognise that 2011 is the 400th anniversary of the King James Bible. The new stamps are currently available at all Post Office branches. For more information, visit The British Postal Museum and Archive. Christmas Nativity Stamps are excellent this year. Especially with the anniversary of the King James’ Bible. Please, can we have the choice of Nativity stamps every year?